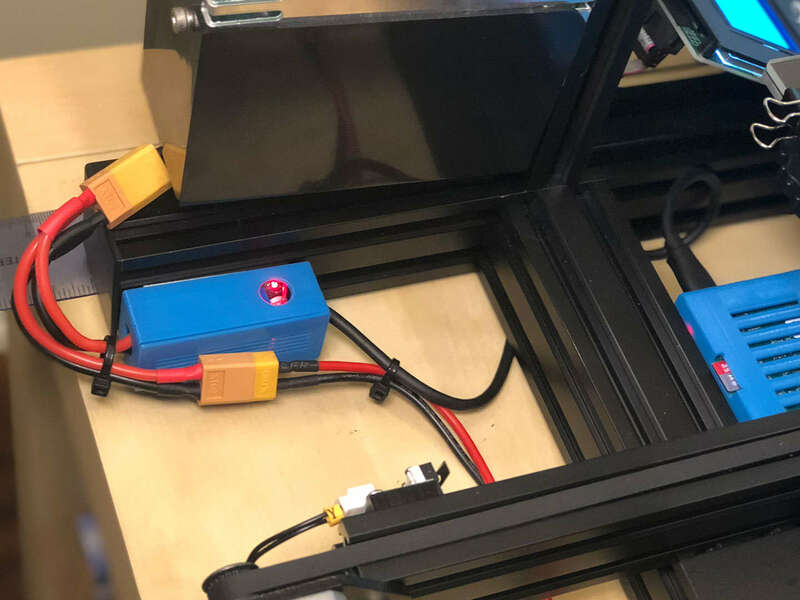 This guide will show you how to power a Raspberry Pi using your 3D printer's power supply. This is especially useful if you're using OctoPrint and only want to run your Pi when your 3D printer is running. 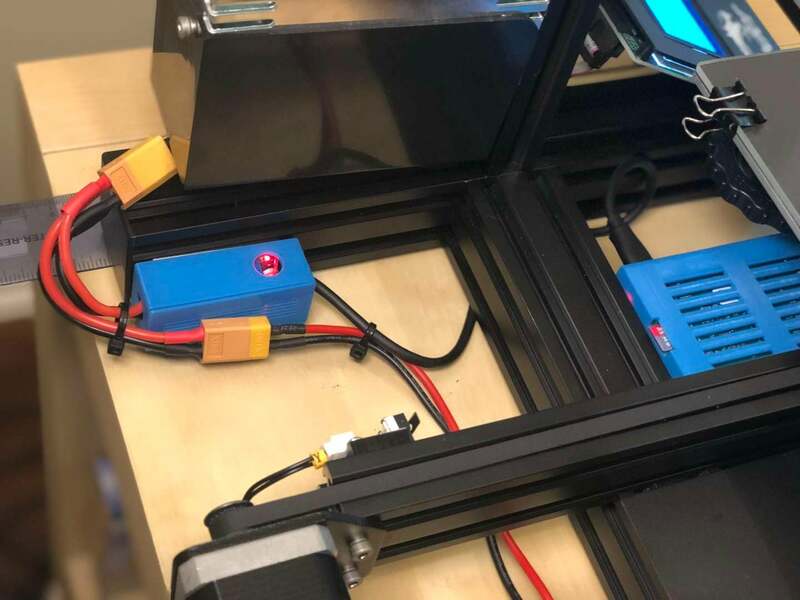 In a nutshell, we're going to connect our printer to a small voltage regulator, also known as a "buck converter" or "step down converter", to reduce the printer's higher voltage to the 5V needed by the Pi. Important note: This guide involves electricity. Take proper precautions even when working with low voltages. Secure all wires and power on the Pi! Before we can connect the LM2596 voltage regulator, we'll need to determine where the connection should take place. For this method, open up your printer's power supply unit (PSU) and run a new positive (+) and negative (-) wire from one of the available slots. If you're lucky, your PSU might have a separate 5V power output terminal. In this unlikely case, no voltage regulator is needed! You can skip forward and connect these lines directly to your Pi. However, be sure that at least 2A is being output, or else you'll need to use another supply line. Note: Before opening your power supply, disconnect your printer's power and wait for any capacitors in the PSU to discharge. For this method, we can splice into one of the wires already coming out of your power supply. By splice, I don't mean strip and use electrical tape. I recommend using some kind of Y-splitter cable to split the power out. This method takes less time because no PSU disassembly is required. Additionally, it takes only seconds to revert the change if you'd like to undo your modifications. For these reasons, this is the method I'm going with. My printer is the Creality Ender 3 and uses common XT-60 connectors. Some printers use other connections, however; thus, be sure to choose a Y-splitter cable that will work with your printer. The rest of this guide will work for you regardless of which approach you choose! 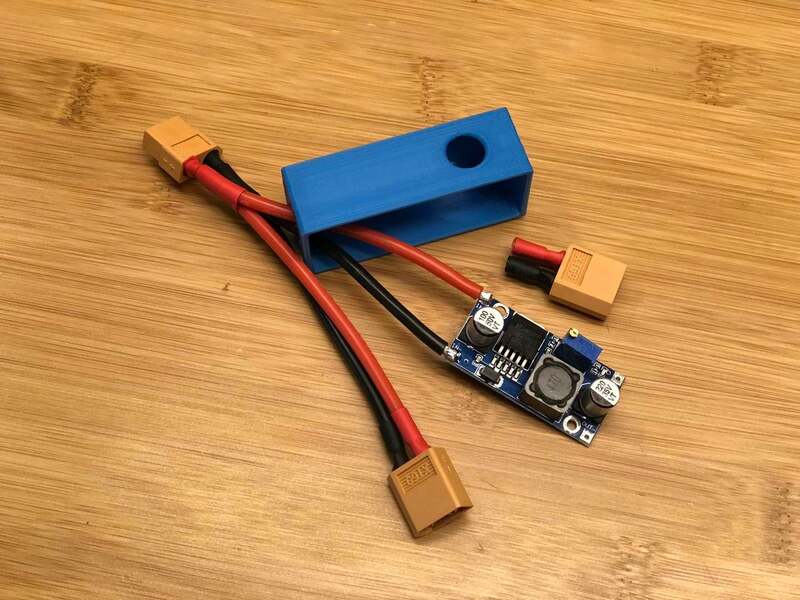 Now we're going to connect the INPUT side of the LM2596 voltage regulator/buck converter to the printer's power supply. Since I'm using method #2, this means soldering my Y-splitter cable directly to the converter. I recommend printing a small enclosure for your LM2596; you can find tons of these on Thingiverse. The exact enclosure I used is included with this printer-mounted Pi enclosure. First, Cut and strip one "leg" of the Y cable. Then, solder the red positive (+) wire to the positive (+) INPUT terminal. Finally, solder the black negative (-) wire to the negative (-) INPUT terminal. Be sure to thread the wires through the enclosure opening before soldering them. The Raspberry Pi uses a Micro USB port for power, so we'll need to solder one to the output terminals of our buck converter. To do this, we'll cannibalize an old Micro USB cable or AC adapter. Cut open and strip the cable. Locate the red positive (+) and black negative (-) wires, and solder these to the OUTPUT terminals of the buck converter. Again, if you're using an enclosure, thread the cable through the enclosure hole first. Keep in mind how far your Pi will be mounted from the step down converter and don't cut your cable too short! Next, we need to adjust the buck converter's output voltage to 5V. For my printer, the line I'm tapping into is 24V, so I'll be stepping this 24V down to 5V. 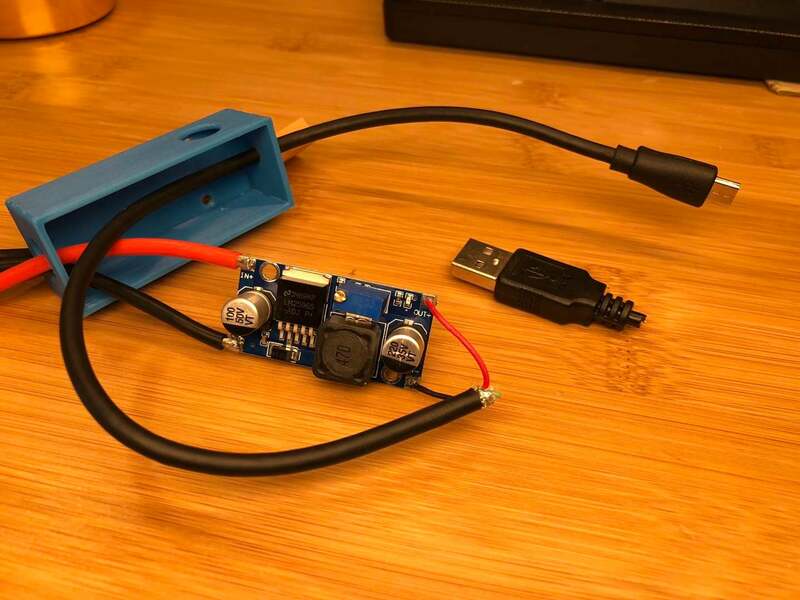 To do this, we're going to connect a multimeter to the buck converter's output, power on the printer (input), and turn a small potentiometer on the buck converter using either a small screwdriver or your fingernail. 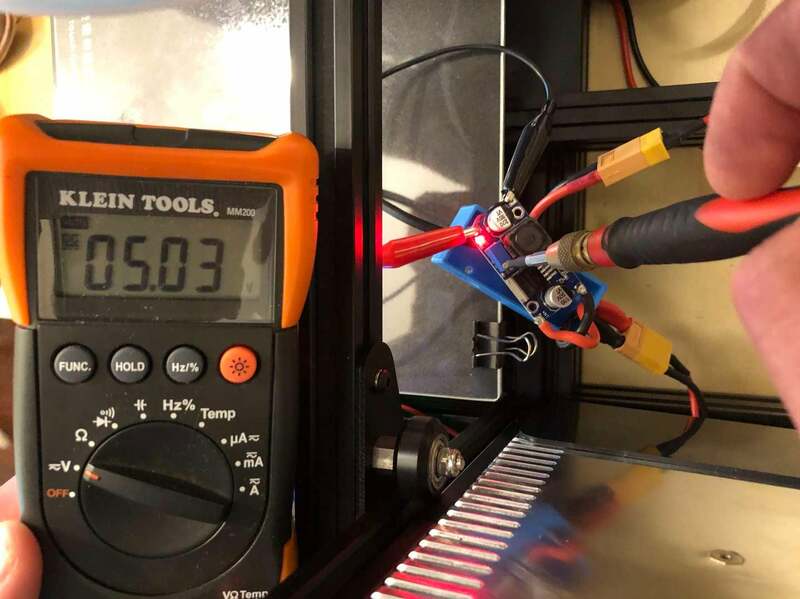 If you don't have a multimeter, you can alternatively purchase a buck converter that shows the output voltage on a built-in LCD display (though these are more expensive). 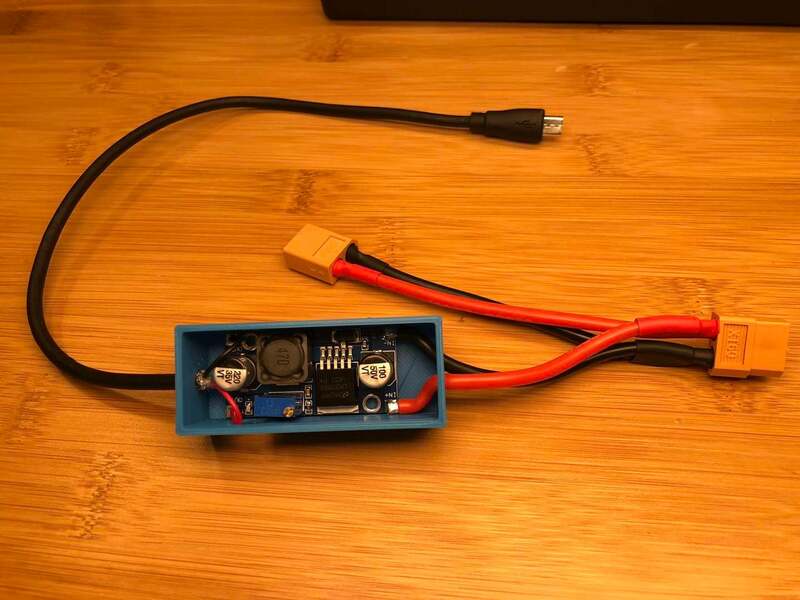 With your printer's power cord disconnected, connect your buck converter to your printer's power supply using either the wires you connected directly to your PSU (method #1) or the Y-splitter cable (method #2). Make sure neither the buck converter or any of your wires are touching any metal. Then, set your multimeter to DC and connect it to the output terminals of the buck converter. I recommend using alligator clip leads if you have them; if you don't, a second set of hands helps. After you're sure all hands and wires are free from any contact, connect your printer's power cable and power it on. Turn the small potentiometer until your multimeter reads 5V. Then, turn off and unplug your printer. Be EXTRA careful when working around live power so that you don't electrocute yourself or your electronics. 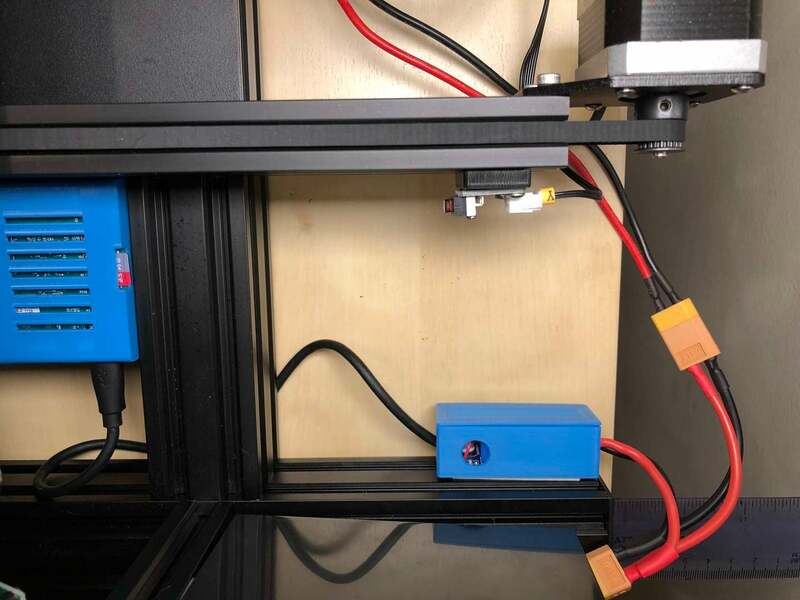 Secure the LM2596 enclosure to your printer using foam tape, taking care not to mount it in the way of any moving parts. Connect the USB cable to your Pi. Use zip ties to secure your wires away from any moving parts and power on your Pi. Pat yourself on the back, you're all done! If you're working on an OctoPrint setup, be sure to check out my comprehensive OctoPrint setup guide. Remember, you should always safely shut down your Pi through the OctoPrint interface prior to turning your printer's power switch off.